France has its own way of honouring soldiers who gave their lives on the battlefield. You can give a donation to the Bleuet de France and wear a blue cornflower to support servicemen and women and victims of war. The charity is managed by the ONACVG , the Office National des Anciens Combattants et Victimes de Guerre. The organisation collected €1.9million last year during its two fundraising periods, around May 8 and November 11. For every €100 donated, €58 goes to ONACVG servicemen and their dependants, €25 helps to organise memorial events and €17 goes towards organising and promoting the collections. The money raised last year has been used in particular for four social projects which helped equip ONACVG’s nursing homes, gave financial help to the worst-off victims, gave aid to children who have lost a parent due to war or terrorist activities and been made wards of state, and contributed to sports equipment for those who are disabled due to war wounds. The charity began when two nurses started a workshop in 1925 to help wounded soldiers from World War One make cornflowers out of material which they could sell to help bring in an income. trenches; and blue is one of the three national colours in the French flag. 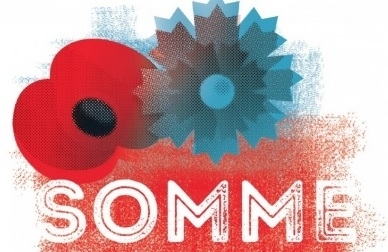 To honour the soldiers who died and to show support for both the British and French organisations, Connexion is again proud to print both the poppy and cornflower side by side on its masthead. This year, for the first time, the Bleuet de France joined together with the Royal British Legion so that those attending the commemoration of the Battle of the Somme in July wore both poppies and cornflowers and laid wreaths with both flowers. The Royal British Legion has produced a collection of poppy and cornflower lapel pins, wreaths and mugs and coasters in memory of the Somme which can be bought, with profits going to the charity. Bleuet de France says it would welcome anyone who would be willing to sell the Bleuet de France, even if they only have an hour or two to spare. The Connexion has put an Australian charity in touch with Bleuet de France because they want to add a blue cornflower to their collection of poppies and asked for help after reading an article about the French war victims’ charity on our website. The Letter to the Fallen project was launched with a letter from former Australian prime minister Tony Abbott and invites young and old to write a letter to the unknown fallen Australian soldier whose grave is in Flanders Fields. They have poppies from all over the world and an original signed Earl Haig programme from the first poppy day together with the poppy. Bleuet de France says it is pleased to be involved.